Cedar Valley College Family Music Theatre (FMT) celebrated their 25th anniversary in April. A musical revue that month brought many longtime participants in the program, started by Dr. Sam Germany in 1994, back to celebrate. Seventy-five of them joined in singing a version of “You Will Be Found” from the hit new Broadway musical “Dear Evan Hanson” on the Cedar Valley performance stage. An 18-piece live band was also featured on stage playing swing, jazz, and big band music for a packed, appreciative audience. 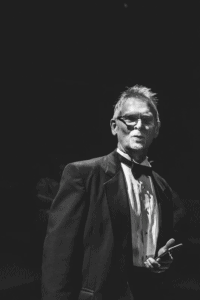 Nobody smiled bigger during the anniversary revue than Dr. Germany, who everyone says is the driving force behind FMT. Cedar Valley College opened 40 years ago, and had only been open three years when Sam Germany arrived from Michigan to teach music and voice. He had recently obtained his master’s degree, and was continuing work on his doctorate at the University of North Texas in Denton. He also served as choir director at New Life Bible Fellowship Church in Oak Cliff (now New Vida Church of God). When his department head Jerry Cotton asked him to also direct shows, Dr. Germany replied yes, with two conditions. As a voice major, Dr. Germany wanted to do musicals; and as a devoted family man and father, he wanted to be able to bring his children to rehearsals. Dr. Germany says he realized rehearsal would occupy a lot of his time, and wanted to open his sons’ eyes and ears to musicals. His son Samuel came with him to many rehearsals, and even at a young age watched every rehearsal intently. Samuel has since appeared in numerous shows and still performs when he can. The auditorium and theatre space in Building E, formerly a video production space, had to be molded into a performance venue. Dr. Germany says they found second-hand sound and lighting systems, along with a curtain. The FMT space seats 306 in a three-sided box configuration. There are no wings, so when there is a large cast involved “who moves off stage is as important as who comes on,” Dr. Germany said. Dr. Germany’s first show to direct was “Godspell” in 1994, although he had provided musical accompaniment for “Fantasticks” the spring of 1994. For the first few years, he said, they didn’t charge admission while attempting to build an audience. FMT started selling tickets in the fall of 1998, and have now presented 31 productions to appreciative audiences who are searching for family entertainment. Various schools from the Best Southwest area including Duncanville, Grand Prairie, Lancaster, Midlothian and Red Oak elementary schools, have attended preview excerpt performances of FMT shows over the years. 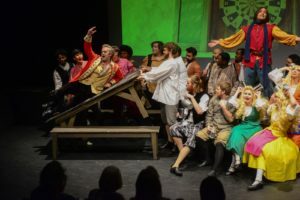 Dr. Germany said they have solid evidence this program is working, since the two leads in “Disney’s Beauty and the Beast” last spring were once elementary school students who saw their productions at Cedar Valley College and Family Music Theatre. Kathryn Boswell, currently performing on Broadway as swing in “Anastasia,” and John Campione, in the national touring company of “School of Rock,” are FMT alumni who have gone on to enjoy careers in musical theatre. Campione will be back in town August 15-26 with the “School of Rock” tour presented by Dallas Summer Musicals at the Music Hall at Fair Park. Auditions for Family Music Theatre’s fall production, “Disney’s Newsies, The Broadway Musical,” will be held August 13-14 at Cedar Valley College Performance Hall, 3030 N. Dallas Avenue in Lancaster. All members of the community are invited to audition. Performances will be October 12-13, 19-20, 26-27. For information, go to cedarvalleycollege.edu/fmt. Online audition sign up is at familymusictheatre.com. Other FMT musicals scheduled for 2019 are “The Secret Garden,” Feb. 22-23, Mar. 12-2, 8-9; and “Ragtime, The Musical” June 21-22, 28-29, and July 5-6.